When we think of Scandinavian design we typically think of whitewashed walls, natural wood floors, rooms flooded with light and....Ikea! People are shying away from big, heavy sets of furniture and moving toward Scandinavian furniture because it has a lot of classic elements but also lends itself easily to modern interiors. Scandinavian design interiors aim to maximize lightness and has no place for clutter as the background for it was the emergence of social democracy in the 1950s and the availability of new low-cost materials. It makes use of form-pressed wood, plastics, anodized or enameled aluminum or pressed steel and thanks to modern mass retailers, clean lines and simple silhouettes have become mainstream. The Swedish countryside is dotted with endless lakes, mountains and small villages and a distinctive clean aesthetic that is both functional and beautiful. Scandinavian furniture has universal appeal and works well with country farmhouse and modern pieces. The Swedish proverb "Lagom är bäst", literally means "Enough is as good as a feast" and the Duluth Forge Fireplace has just the right amount of simplicity and functionality. This Ventless Fireplace has been carefully designed in a clean white finish that accents its quality and excellence. Includes many features like a remote control, Oxygen Depletion Sensor with automatic shut-off, battery assisted piezo ignition, and much more. 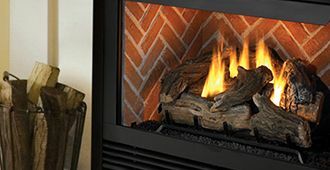 Using Natural Gas or Liquid Propane, the Duluth Forge Ventless Fireplace radiates 26,000 BTU of heat, enough to heat 1,350 square feet of space. Fika (pronounced fee-ka) is a Swedish custom where people gather to have a cup of coffee or tea and a few nibbles and it is such an important part of life in Sweden that it is both a verb and a noun. The Grand Haven 4-Piece Acacia Wood Outdoor Patio Sofa Set with Table is the perfect place to enjoy a Fika or any outdoor gathering. With extra thick cushions and a plethora of throw cushions, the Grand Haven Outdoor Patio Set offers all the benefits and style of an indoor furniture set with the durability of Acacia wood to be kept outdoors. The stylish modular design fits any space and the open construction side rails allow for maximum air flow to stay cool on those hot summer days. High quality construction and hardware provide year after year of worry free use. In a country with endless coastlines and primordial forests, any time of year is great to spend outdoors, whatever the weather. If there’s one thing Sweden has plenty of, it’s open landscapes and this full size electric peninsula fireplace allows for 180 degree viewing! The ProCom Electric Peninsula Fireplace includes a brick-lined firebox, hand-painted log and a beautiful oak finish mantel. 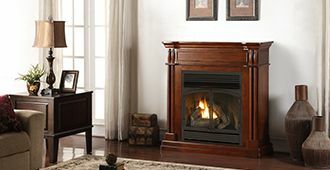 The detailed and unique design ensures your fireplace will look great in any room of your home. Perfect for any sommarstuga (small Swedish summer house), the Duluth Forge Dual Fuel Ventless Fireplace Insert! The arched style ventless fireplace insert features a beautiful ceramic brick liner with dancing yellow flames and five hand painted ceramic fiber logs. Using patented dual fuel technology, this gas fireplace insert can operate using either Natural Gas or Liquid Propane and provides 15,000 BTU of heat, enough to heat 600 square feet of space. The fireplace insert is designed as a zero-clearance firebox which allows for custom built-in installations making any installation easy and the stylish arch design is perfect for a cozy living room.